Holiday and Summer Camps for your convenience and your child's enjoyment! AIM and AIM KIDZ will be close at 3:00 on Thursday 4/18. At AIM we believe in movement! We are an active summer camp filled with tons of fun activities to keep your children busy over the entire summer. Our goal is for them to make lasting friendships and memories while in a positive and exciting environment. We encourage our campers to play various games, sports, relays, participate in crafts, guided free play, and weekly cooking and science experiments. At AIM, children are expected and encouraged to participate. We know that kids have varied interests, so we pack our summer schedule with many different activities. You have the option to sign your child up as a daily or a weekly camper. Weeks are calendar weeks, Monday-Friday and will be counted in that way. Days can be used in way you like. When registering for camp there is a minimum daily purchase of 20 days; there is no minimum on weeks. We offer drive-thru drop-off and pick-up service between 6:30-8:30 and 4:00-6:00 every day. I lead general assembly at 8:30 every morning, so we request that all campers arrive by that time. Campers will be split into groups for the day and I will go over camp rules, behavior expectations, and daily and weekly activities. Campers are divided into groups based on their grade for the 2018-2019 school year. Campers in K-2nd wear blue or purple shirts, 3rd-5th wears green or yellow shirts. These shirt colors are divided into smaller groups averaging 25. Campers are allowed to choose their group daily as long as they have good behavior and arrive to camp on time. Campers arriving late will be placed in the group with the fewest campers. Monday-Thursday campers will rotate through the different areas of the gym with their group. Each day offers different scheduled activities. Monday and Wednesday: Choice Days. Grade groups have designated choice times where campers will choose to do one of three activities. Choice90 offers sports, crafts, and games. Campers will also go outside for recess . Tuesday: Cooking. Campers will learn recipes and how to follow them as well as enjoy the tasty treats they create! Thursday: Science projects and experiments keep their minds engaged and intrigued. Friday: FUN Friday means no numbered groups! Campers will get to choose their activities for the entire day. Summer Camp 2019 Information Packets are ready. Stop by the gym to pick one up. You will need to read through the packet before registering. Packet pick up does not commit you to anything. You do not need to worry about reserving your spot, as registration will continue throughout the summer. However, the earlier you register, the cheaper your camp rates are, and you'll have more time to pay! AIM summer camp accepts students in Kindergarten-5th grade for the 2018-2019 school year. Summer camp is open May 28-August 2 (closed July 4th). Camp hours: 6:30 am - 6:00 pm. A great way to try us out before summer! Need a place for the kids to play so you can work, run errands, or clean the house? Need to get those kids out of your hair? Are they climbing up the walls? Look no further! 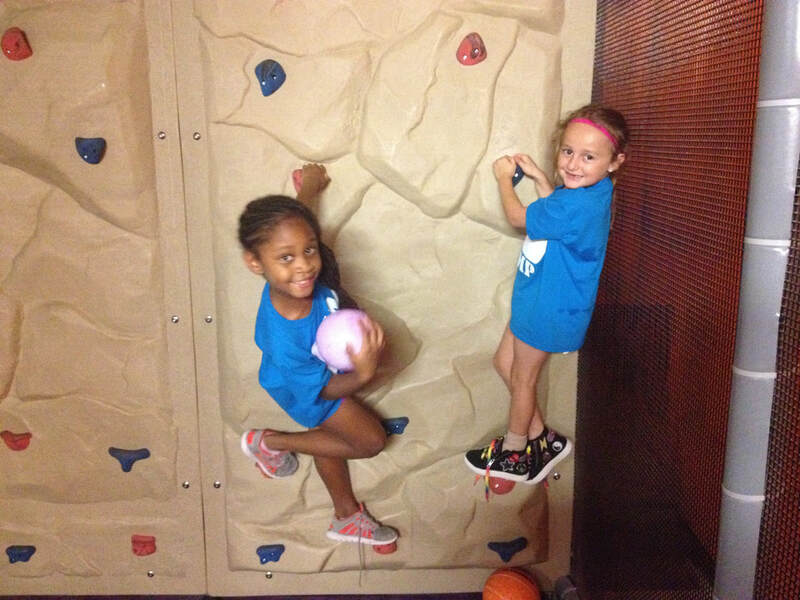 Drop them off at AIM for a day of fun where they will socialize and stay active all day! Kids will get to play active games, enjoy the Pit, Kids Korner, table games, and the Game room. Please dress kids in clothes ready to play: t-shirt, athletic shorts, tennis shoes. ​No buttons or zippers and no slip on shoes. Members are those currently enrolled in gymnastics or who attended summer camp 2018. Download the registration form above and complete once per school year. ​Open 6:30 am - 6:00 pm. Drop off and pick up in blue trim building between 6:30-9:00 and 3:00-6:00. Kids play in red trim building 9:00-3:00.